Have you ever heard the phrase “kitchens and bathrooms sell houses”? Well its beyond true! Think about it, when you go into people’s homes what’s the first thing you look at? Their kitchen and bathrooms. Another room people look for is the infamous “man cave”. 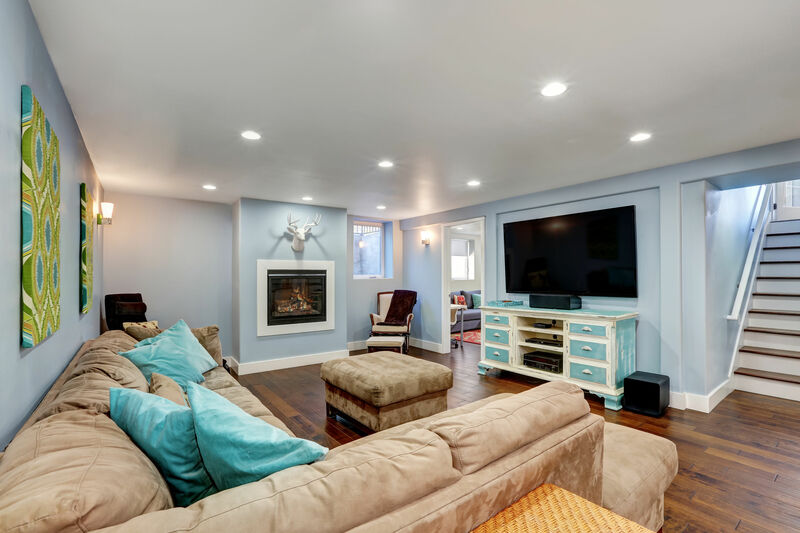 A finished basement can add a ridiculous amount of square footage to a house and make the home that much more appealing to the buyer. If your remodeling to sell your home, these three areas are ones to focus your remodeling budget on first. Here are some simple and easy tips to bring your home up to buyer’s standards. What’s the way to your heart? Food? Yeah me too! That’s why I believe they call the kitchen the heart of the home! I would say you want to spend the biggest amount of your remodeling budget here. If the floors are vinyl, you can easily place beautiful laminate flooring on top of it. This is cheaper than hardwood floors but will make a world of a difference in the look of your kitchen. Painting the kitchen cabinets are a simple but impressive upgrade. Surprisingly it’s not that hard either. Hardware stores have specific paint for cabinets that make them look incredible. 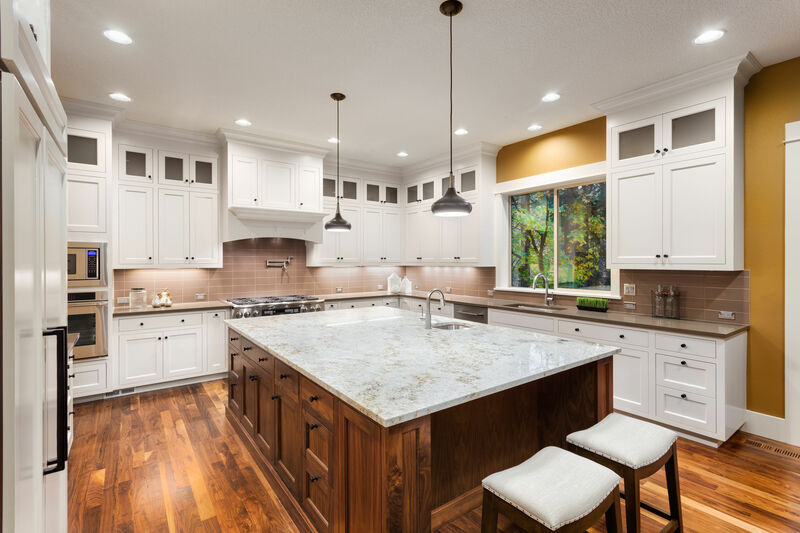 Using white for the main cabinet color along with painting the cabinets on the island an accent color such as gray will brighten up the kitchen! It will also help the kitchen feel bigger. Add a beautiful white and gray backsplash and you have yourself a brand new modern kitchen that buyers will love. The bathroom is another place where people spend a good amount of time. You get ready, shower, and take nice long relaxing baths in the bathroom. Buyers are looking or a spa like feel so that they have a place to relax. Just like the laminate floors that I mentioned for the kitchen, you can put the same ones over top the vinyl in your bathroom. These you can easily install yourself and it doesn’t take much time. HGTV has some great detailed explanations of different kind of flooring options. 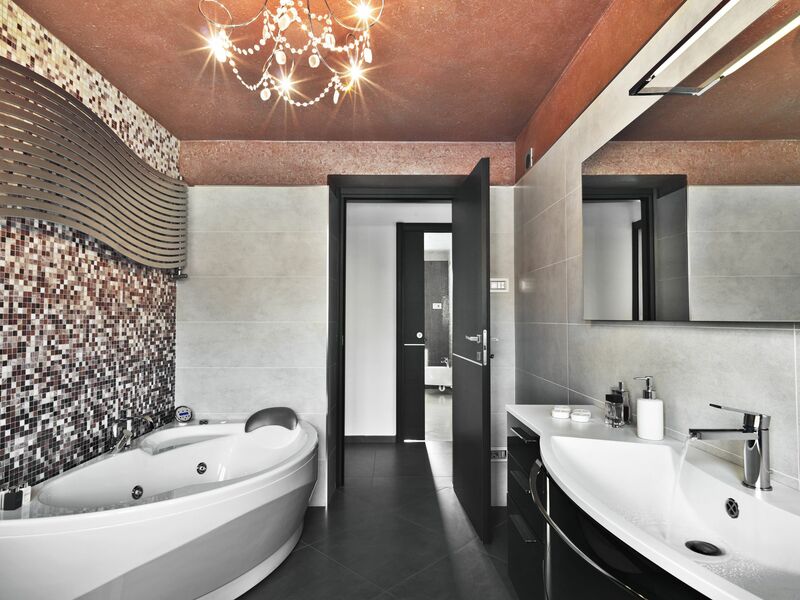 If the bathroom is smaller, make everything light and bright. Paint the walls a white or lighter color. If the cabinets are dark, again you can paint the cabinets white. If there’s some more money in the budget, tile the bathroom tub walls. All these little details will give it a luxurious spa look. When staging the home add a splash of color such as teal or purple with hand towels and soap holders. Now on to the basement! A lot of people neglect this space, but like I said before this can add so much square footage to your house. More square footage means more money for you! If you don’t want to take on this task yourself, hire a professional. It will absolutely be worth it to make sure it’s done right. Since the basement is somewhere moister finds itself, there are some limits to the flooring you can use. Some options are engineered wood, ceramic tile, rubber and laminate flooring. If your finishing a basement, you’ll have to make it up to code. Adding an egress window well will be needed for safety in a basement living area. You’ll be able to purchase and install a window well customized to your measurements! Installation is easy too. Some other minor things you can do is paint the walls all white or a neutral color, paint the baseboards white, and give your front door an inviting color. Now that your home has a beautiful kitchen, refreshing bathrooms, and a finished basement, you are ready to sell!